We have been potters and tile makers for 40 years. Barb Jensen is a painter and hand-builder; Mick Marineau is a thrower and sculptor. 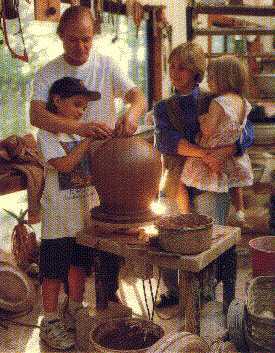 Together we make every piece that comes out of our pottery. We live in a house we built ourselves in the country near Portland, Oregon, with our two kids, a big garden, orchard, and various animals. Our pots, lamps, and tiles are made entirely by hand from the wet clay to the final firing. Designs can be repeated, but no two are ever exactly alike. The images are drawn using a combination of slip-trailing, carving, and brushwork. The line quality created by slip-trailing gives the tile a whimsical character and a raised surface that adds texture to a room. the carved black and white pieces have a look similar to a wood-cut print. Our tiles are suitable for light domestic use indoors or out; for walls, fireplace surrounds, counters, backsplash, showers, bathtubs, and pools. Quality work, good service, and happy clients are our priorities. We hope you will feel comfortable choosing our work, confident that you are choosing a classic look in a material that will last forever.